A unique, creative element in a property will really stand out from the norm and become a catalyst for a lot of conversation. 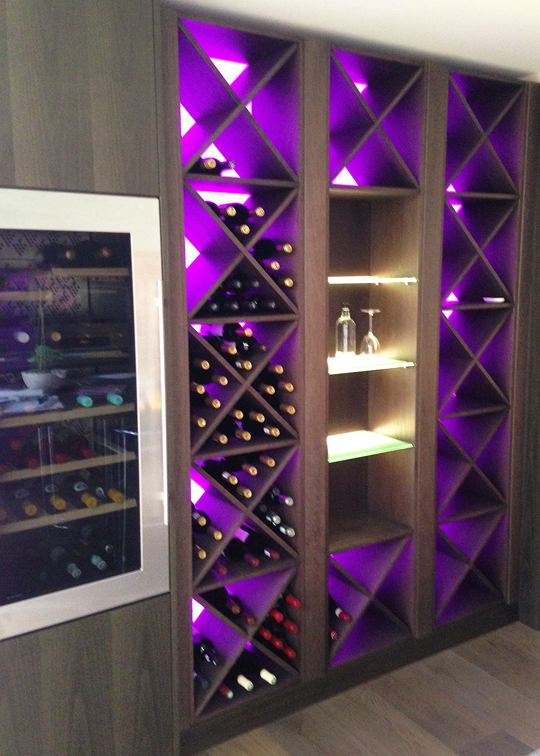 When Lightwave were recently given the chance to assist with a custom built, colour-changing wine rack we jumped at the chance. Our high-powered RGB colour-change LED tape was installed behind a Barisol-style material which is stretched over a steel frame. We have used this technique on many past projects to create a seamless, fully diffused ‘wall of light’ effect which is what the client wanted to achieve here. The final effect was stunning and the wireless controller provided allowed the home owner to choose any colour or range of colour effects as they desired with ease – a feature great for creating a funky, contemporary ambience for parties and social events.